Often ‘very good’, occasionally ‘rather impertinent’ and sometimes ‘very naughty’ – all descriptions of 12-year-old Queen Victoria from a previously unseen ‘behaviour book’, one of over 100 items from 250 years of royal childhood that go on display July 26 at the Summer Opening of Buckingham Palace. 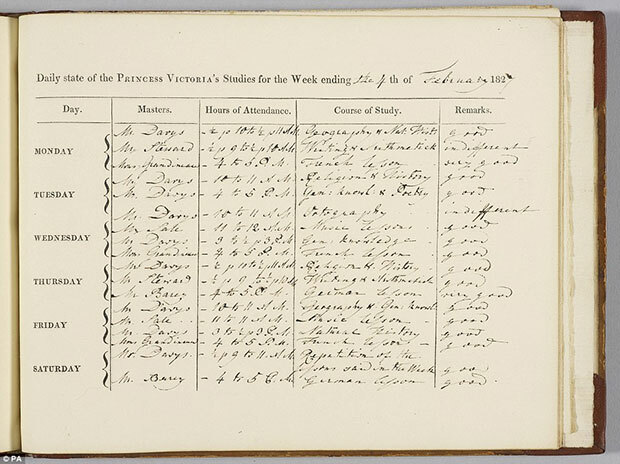 Written in Princess Victoria’s own hand, probably under the command of her German governess, Baroness Lehzen, the behaviour book records the 12-year-old’s daily conduct, ranging from ‘very good’ to ‘very naughty’. It reveals that although the Princess was largely well behaved, like any child she was occasionally mischievous and broke the rules. Among the many ‘goods’ and ‘very goods’ in the week of 3 November 1831, the young Princess also notes that she had been ‘very thoughtless and foolish’ and ‘impertinent’. The following year on Monday, 25 September, at the age of 13, she describes herself as ‘very very very very horribly naughty!!!! !’, although there is no hint as to what Victoria might have done to prompt such a self-chastising comment. Detailed records of Princess Victoria’s progress were kept throughout her childhood, which was spent under the ‘Kensington System’. This strict regime, introduced by her mother, the Duchess of Kent, and the Duchess’s advisor, Sir John Conroy, ensured that the Princess was protected and controlled through constant surveillance and observation. 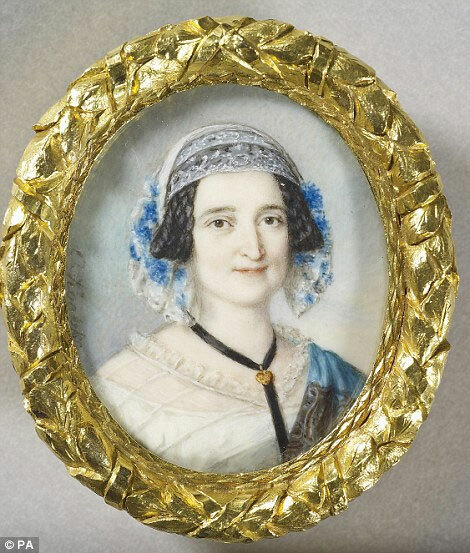 ‘Lehzen’, as she was known within the Household, was appointed governess in 1824, when Victoria was five, and the young Princess soon developed a close and affectionate relationship with her. She encouraged Victoria to think independently, and later became advisor and companion to the Queen. The Princess’s day began at 9am with half an hour of writing in her Journal and recording her expenses from the previous day. She was then given religious instruction, followed by lessons in history, geography, Latin or general knowledge. Her afternoons were spent learning French with Monsieur Grandineau, German with Mr Barez, writing and arithmetic with Mr Steward, and music with Mr Sale. This intense schooling ensured that at the age of just eight Victoria had already developed beautiful handwriting. An exercise book belonging to the Princess in the exhibition includes the repeated phrase ‘Ostend, a sea port in Flanders’ within pencil-ruled lines. Several other items in the exhibition record the schoolwork of future monarchs from across the generations. 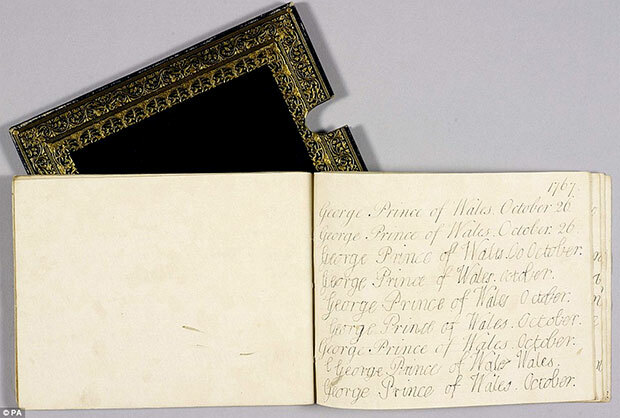 In 1767 a five-year-old Prince of Wales, the future George IV and uncle of Queen Victoria, practiced his handwriting with the lines ‘George, Prince of Wales, October 26′. The progress of Queen Victoria’s grandson Prince George (later King George V) was noted in a journal by his tutor John Neale Dalton. In the week ending 23 September 1876, the 11-year-old Prince was taught for 22 hours in the subjects of religion, music, arithmetic, geography, and writing, as well as Latin, French, English and German. In most cases the tutors’ remarks were positive, although on one occasion he writes that Prince George showed ‘too much disposition to find fault with his brother’. From well-loved toys, treasured family gifts and tiny outfits to previously unseen photographs and film footage, Royal Childhood gives an unprecedented glimpse into life as a young member of the royal family growing up at Buckingham Palace, a royal residence since 1761. The exhibition brings together objects from the Royal Collection and the Royal Archives and from the private collections of members of the Royal Family. Royal Childhood is part of a visit to the Summer Opening of the State Rooms at Buckingham Palace, 26 July – 28 September 2014. The exhibition is accompanied by the publication Royal Childhood by Anna Reynolds and Lucy Peter, price £12.95 or £9.95 from www.royalcollection.org.uk and Royal Collection Trust shops. The 1850s bronze represents the life-size statue featured at the Great Exhibition in 1851.